Suction cups range. Choose by type with examples of uses. Choose by suction cup type with examples of uses. Adams Suction Cups have weight ratings* based on the diameter of suction cups with hooks when applied dry on clean, flat glass. The weight ratings are a guide as to the adhesive strength of the actual suction cup on the surface. *A screw-in fitting, push in fitting or slot head will still have the suction cup adhesion strength on the applied surface, but will lower the holding weight of an attached product due to it's reliance on the thread made in the PVC, the push-in attachment or the closing jaws of a self closing cup. Suction Cups - Types and Uses. Click on any picture for that category or visit our home page for our full range. air freshners, Christmas window ornaments etc. Sizes from 22mm - 64mm diameter with metal hooks. 85mm diameter heavy duty suction cups with standard hook. Holds up to 5.5kgs (12lbs) on glass. ideal as a Christmas wreath hooks or bathroom hooks. Large hook holds 4.5kgs (10lbs). Heavy duty Giant double suction cups with hooks. Holds heavy Christmas wreaths and towels or robes in bathrooms etc. Rated to hold 9kgs (20lbs). than our standard metal hook range. Strong clear 180° Polycarbonate swivel roto hook. Available in 47mm or 64mm diameter. For punched or drilled hole posters and key hole slots on and self hanging products. Suction cups with mushroom head available from 22mm - 85mm diameter. See technical drawings for suitability on any pack size listing page. For thin posters up to 2mm in thickness with punched holes. Flat barbed thumb tacks for a firm grip. For thicker posters - see suction cups with thumb screw below. For thin posters up to 2mm in thickness with punched hole. Same suction cup as above but with large easy grip thumb tack. Use when continual changing of a leaflets/signs is required. For thicker signs, posters, perspex, foam board etc. between 2mm and 7.5mm in thickness. Screw cuts it's own thread into the suction cup and fixes permanently. Useful for tractor perspex screen fixings. As with the thumb screw, use this item for punched or drilled holed signs, posters and other items. These will hold products up to 7.5mm in thickness. The brass nut unscrews and enables the fixed product to be removed and replaced continually. with course screws for fixing a product. Holds an item further away from the fixing surface. Has a top pilot hole for a screw or could be used to push inside a drilled hole. 47mm long gripper neck version can used in a drilled hole for a firm fixing. 32mm version is also available as a suction cup with hook. 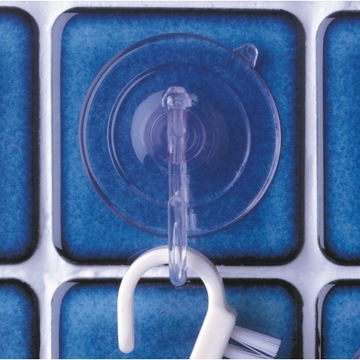 Suction Cups for cord, string, wire, dowel, cable ties or metal ring. Hole goes straight through suction cup to the other side. 85mm diameter. Holds up to 5.5kgs (12lbs). Available with hooks, loop for rope or straps, top pilot hole for a screw or bolt, mushroom head or side pilot hole. aquarium airlines (large slot head). For door and window signs, documents and literature. Space gripper for transporting glass and acrylic sheets. Separates and cushions parallel glass surfaces in the horizontal plane. Remove recessed halogen GU10 light bulbs. electronic devices. 47mm - 64mm suction cups. 85mm suction cups have a large loop for rope.